Back from Holidays, you started the year well motivated to make the world a safer place. However, sitting at your desk today you realize nothing really changed since last year, and you are surfing the web, feeling a bit blue, trying to avoid that pile of emails waiting for you and wondering how you could gain some visibility on your domain in order to better defend it. In this post, and continuing where I left it in 2018, I would like to share some Cypher experiment with you. To achieve this goal, we are going mark nodes as “Blacklisted” using labels, to then query paths excluding nodes labeled as such. Now all we need a path query that excludes blacklisted Nodes. To mark our start nodes and end nodes, we are going to hijack the owned/highvalue features of the UI. This will give us a quick and easy way to mark start/end nodes and query our paths. The added Cypher on line 30 allows us to look at each node on each path, and return only paths where none of these nodes are labeled as Blacklist. First, using the NODES() function, we take all Nodes where label “Blacklist” is set and store them in a variable x. Then, we filter paths where x is equal to nothing using the NONE() function after a WHERE clause. Now that we have all these Cypher queries, the last thing we could do to make our life easier, is tweak them a bit, format them in some obscure JSON, and add them to the BloodHound UI. You can paste this content into your Custom Queries and you should have something like this to tinker with… Hope you like. 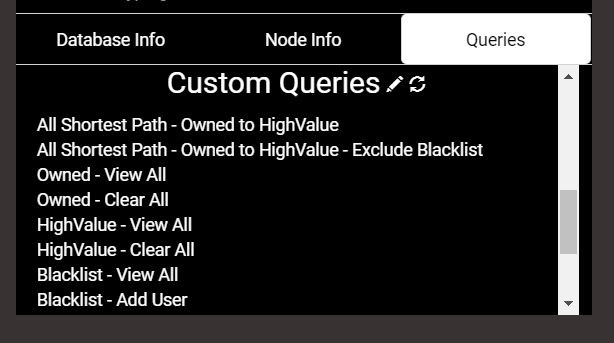 We can now mark start nodes [Owned] and end nodes [HighValue] via the graph, and manipulate the blacklist on the fly via the Query tab… Achievement Unlocked. So that’s it for this post, I hope you found some useful bits in there, and that you now want to dig deeper into BloodHound and custom Cypher queries. I will be adding those features to the upcoming version of CypherDog that I will be presenting at Troopers (and at the PoSh Summit in Seattle) later this spring. In the meanwhile, hit me on Twitter or BloodHound slack if you have any questions or remarks. Arrroooooooo & Best Wishes for the coming year.